• Hair Types & Treatments.. • Healthy Hair • Shampoos & Conditioners..
• Colour Your Hair • Perfect Hairstyle • Hair Styles & Accessorie..
• Hair Problems & Treatmen..
All the hair you`ll ever have on your head is determined at birth. That`s because hair grows from a root in your scalp and the number of roots cannot be changed. Each hair grows from the root to a certain length depending on your unique genetic makeup, then slows down and then stops naturally. At some point, it`ll die and start shedding. A person loses about 100 hairs every day from this life cycle. A new-growth shaft then replaces the lost hair. This is a normal cycle with the hair of all individuals. However, you can increase the volume of individual hairs, and thus make your hair appear more full, with protein shampoos and conditioners that coat each shaft. 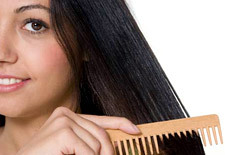 Thus, given below are a few steps to have healthy hair. The comb must be made of animal bristles that have naturally rounded tips. Nylon or any manufactured bristles have straight ends that can snag the hairshaft and cause it to break. The bristles must be evenly spaced, embedded in rubber, and attached to a sturdy handle. The teeth are widely spaced. Don`t use a comb that has thin, close teeth. Rubber will cut down on the static electricity that is built up when you brush. Also, the comb should be sturdy and should not bend when you run it through your hair. Do not pull the brush through a tangle. Spray the tangle with a dilution of crème rinse to loosen it, then use your fingers to separate the tangle, then brush. Preferably, use a comb after shampooing instead of a brush. Wet hair is not as strong as dry hair, so you have to treat it gently. Wash the brush every other time you wash your hair. 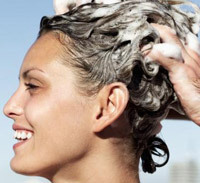 The best solution is to add a dollup of your shampoo with a few drops of ammonia in warm water. Give yourself a frequent brush massage about once a week. Only once a week is sufficient. Brush with firm, regular stokes from scalp to the chin, until the scalp tingles, for about 10 minutes. Then hold your hair in one hand and brush the ends below your chin. You would not want to run the brush all the way through long hair in one stroke because it puts too much pressure on the root and could pull the shaft from its root. 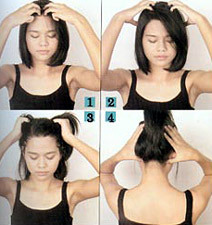 Bend over and brush the underside from your nape to the top of your head in short, regular stokes. Since hair is mostly made of water and to be kept shiny and supple, your hair needs to be adequately hydrated. You lose water from the sun, too much processing, and blow-drying. And the oil from your scalp coats each shaft and acts as a barrier against evaporation. Your hair also needs proper blood circulation to remain strong, which can be increased with brushing and scalp massage. Massaging the scalp helps keep your hair healthy and can also promote hair growth. Just as body massage relaxes you and is one of the most effective ways to ease your tension and pain, massaging your scalp is also beneficial because it is extremely relaxing, calming, and helps relieve headaches and migraines. It stimulates the blood flow thereby nourishing the hair follicles, which in turn prevents and fights avoidable hair loss, and re-establishes the natural development of healthy hair. Take oil and start from the forehead hairline along the arteries in the front, side, and back of the head, making small circles with your fingertips. Work your way toward the top of the head as if drawing a circle. Massage your hair/scalp for just ten minutes a day, once in the morning and once in the afternoon. Do not give up after a few days. You can also massage your scalp when shampooing your hair. Remember massage your scalp with your fingertips and not your nails. Avoid excessive brushing because not only does brushing too much, damage your hair because it scrapes away your hair cuticle but it also makes you oily hair oilier and dry hair more brittle. People with oily hair especially need to massage as they age because they are more prone to a slowdown of circulation. Electric scalp vibrators with heat unit are the best tools for this. We recommend that you follow the suggestions listed below to help you to get your hair into a good condition. Combing helps spread the natural oils through hair, making it look shinier and healthier. Always comb your hair gently to prevent breakage. Hair is at its weakest when wet. So never brush your hair when wet. As far as possible let your hair dry naturally. Take proper care of your hair and they will in return compliment your personality. Use dryers only when you are pressed for time or when you want to set them for an occasion. Detangle your hair before you wash it. Wet hair is very fragile so brush your hair thoroughly before getting into the shower. Massage scalp regularly to increase oil secretion. Also oil your hair at least twice a week or for a day before washing. Oil really does wonders for your hair; coating each strand and making it shine. Besides oil massage also increases the circulation in the scalp and promotes hair growth. Avoid using harsh shampoos and conditioners, as they are highly alkaline and can harm your hairs` pH balance and make them dry. Tackle dandruff with good antidandruff shampoos. Always wash your brush and comb when you shampoo your hair. Avoid lending your brushes and combs to others. Most of all try to keep your hair clean and do not expose it to strong wind, dust and pollution. Use a scarf while on a two-wheeler. Leave your hair untied for atleast four hours a day. This eases the pressure on your scalp and gets blood circulation back. Finally, follow a healthy and balanced diet. Nothing promotes hair growth better.